What was a Plank House? The Plank House was a typical structure used as a house style that was built by many tribes of the Pacific Northwest Coast cultural group who made them their homes. The windowless Plank Houses varied in size but were built in a rectangular shape using planks of wood from red cedar trees. Tribes who carved totem poles included these at the front of the Plank House displaying the ancestry and the social rank of the occupants. The front of the Plank House might also be painted with special animal totems and symbols. Definition: The Plank House is a dwelling made from the red cedar trees consisting timber of hand-split planks a log framework over with an interior pit. 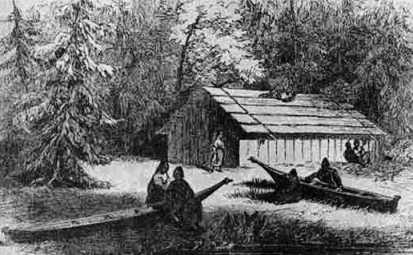 Plank Houses were used by various tribes along the Pacific Northwest Coast from northern California all the way up to Alaska. 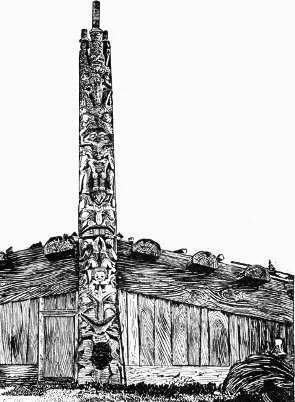 Many of the Plank houses built by the Northwest Coast tribes were painted with elaborate designs and symbols and a few of the tribes featured integrated Totem Poles in the entranceway of their home. The name 'Plank House' derives from the construction method that utilized long, thin, flat pieces of timber (planks) in the building and flooring of these distinctive houses. The Plank House was commonly used as a home by the Northwest Coast Native Indian Tribes who inhabited areas with tall dense forests, oceans and rivers. Their locations stretched across the states of Washington, parts of Oregon, southeast Alaska, British Columbia, the Yukon in Canada, Queen Charlotte Islands and Vancouver Island where the climate was very warm summers and cold, rain drenched winters. 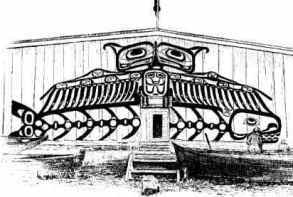 The names of the Northwest Coast tribes who lived in the Plank House houses in the southern parts of the region included the Clatsop, Cowlitz, Kathlamet and Wahkiakum. The more northern tribes, who also erected totem poles, included the Tlingit, Haida, Bella Coola, Chinook, Tsimshian and the Coast Salish tribes. Many of the Northwest tribes lived in villages in which the Plank houses were arranged in a single line parallel with the river or stream along which the village was located. Large permanent winter villages consisted of up to 40 Plank Houses, housing up 1000 people. The Plank Houses varied in size but were built to house a several family groups. The house of a chief was the largest, measuring up to 300 feet (90 m) long. During the summer season many of the people would move location. The villages all had fish-drying racks, sweathouses and workspaces to build canoes that dominated the village shoreline. The construction of the plank house was such that the wall planks were secured with cedar ropes to the upright posts and beams. This allowed the people to deconstruct their homes and take the wall planks with them to the next location. The main framework of the Plank house was left intact until the people returned and reconstructed their homes ready for the winter season. The Plank House construction was used by other tribes such as the Mojave who inhabited California. These plank houses were built in similar styles to the Northwest coast tribes but included additions such as a Ramada, a simple shelter that was open on at least three sides offering shade during the summer. 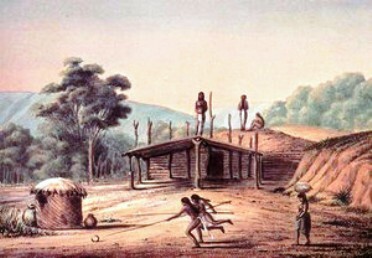 Every tribe choose a type of housing to suit their lifestyle, the climate, the environment and the natural resources (known as biomes) that were available to them, and the tribes who built Plank Houses were no different. The Mojave made good use of the California redwood trees to build their houses. How was a Plank House built? The large houses varied in size and ranged from 20 to 60 feet wide and from 50 to 150 feet long. 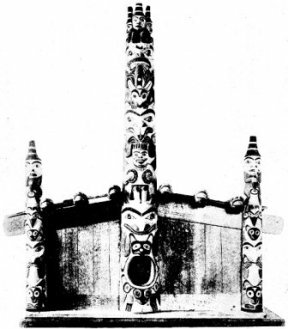 The Plank House was accessed via a doorway or for some tribes featured a Portal or Entryway Totem Pole through which a person entered the house. 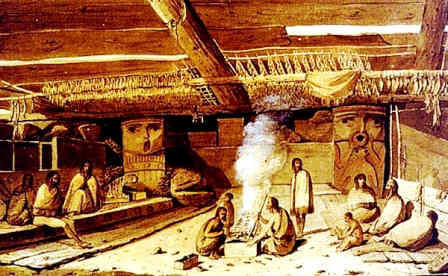 "Interior of Habitation at Nootka Sound"
The Plank House interior included a central hearth, consisting of a fire pit encircled by stones, with a large pot for cooking the meals. Dishes for food and cooking utensils were beautifully carved from wood. The central communal space in the Plank House was flanked by benches used as seats and for sleeping. Beds were located on the floor or benches and consisted of dried grasses that were covered with animal hides. The storage pit was used to keep dried fish, vegetables, and clothing. Personal possessions were stored in baskets, storage pits or hung from the rafters. The fire constantly smouldered in the hearth, and over time the walls of the houses were thoroughly blackened. The homes of the important families had supporting posts elaborately carved depicting grotesque symbolic figures. Some plank houses were partitioned lodges, housing different family members.